Have you ever tried to make jewelry with hot glue? It's so quick and easy to make pretty jewelry pieces with hot glue and you only need a few supplies. This quick craft is perfect for making yourself something special or gifts for a friend. In less than 15 minutes you can make a sparkly pair of earrings or maybe a ring or two. I'll show you how to make a glittery hot glue pendant or a necklace too. Grab your hot glue gun, today we're making jewelry in minutes! You get to decide what color your jewelry is by choosing what color of glitter you use. Mix colors or use just one, it's up to you. If you like to bend your own wire findings, you can create all kinds of shapes for your hot glue jewelry. Today's project is in partnership with some of my favorite creative friends. Angie Holden and Carolina Moore have just published a book filled with hot glue crafts. PLUS, they asked a few of their friends to contribute to the book too… check out page 46 for my project! Here's a look at my project… decorating a picture frame with hot glue art. Let's Party – Hot Glue Party Style! 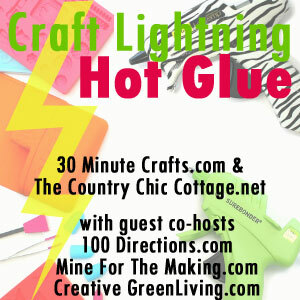 To celebrate all this crafting fun, we're sharing even more hot glue crafts this entire week. Take a look below for a whole list of project ideas to try. Let's make some hot glue jewelry! You can customize your pieces however you like, here's the into to get you started. We're making basic circle shaped jewelry to give you an idea of what you can make. I'm going to go through the steps to make a circle pendant. A note about the hot glue mat. If you don't have a hot glue mat, you just need some kind of surface that the glue will remove from easily. Pliable, waxy plastics or rubber seems to work best. I used recycled packing from a cell phone case, the glue stuck a bit but not permanently. Place an earring hoop on the hot glue mat. Make sure the hoop is closed, or at least the ends are overlapping. Apply hot glue, starting in the center, filling the entire circle with glue. Make sure you apply enough glue to touch all the inside edge of the hoop. Immediately sprinkle a generous amount of glitter over the entire glue area. Gently remove the glue pendant, dust off excess glitter (or the trashcan) and attach to your necklace finding and chain as appropriate. You can repeat these steps for a variety of jewelry pieces. Just create a shape with wire, fill the center of the shape with hot glue, sprinkle on glitter and allow to cool. Looking for an even quicker hot glue jewelry project? Here's one for you… hot glue simple glitter stud earrings. You need: a hot glue gun and glue, blank earring studs, glitter. To make: apply hot glue to the base of the earring stud, hot upside down so the glue creates a bit of a lump. Sprinkle with glitter and set down to cool. Note: sometimes the post of the earring stud can get hot. You can use jewelry pliers to hold the post. Repeat the same steps to make a hot glue ring. You can add extra layers of glue for some extra dimension, just make sure to allow the glue to cool between layers so each layer holds it's shape. I hope you have fun with hot glue crafts this week. Now that you've seen how quick and easy hot glue jewelry is to make, think of all the accessories you can create. Stop by the 100 Directions facebook page and tell me about your projects, I can't wait to see what you're up to! Those look awesome! Thanks for joining!